Track record: Technical Analysis on Silver/USD from 2016-10 to early 2017-03. It’s time to have a look at our analysis of Silver/USD (new window) from October 2016 through early March 2017. Back in October 2016, pattern clarity for Silver/USD was low on most time frames, and we didn’t have any particularly probable Elliott Wave formation to go by. It is important to know when pattern clarity and uncertainty is high. It’s one of the most hard-learned lessons for traders, Investors and analysts who really want to get it right. Trust us. Anyway, one of the technical systems we use for our comprehensive technical analysis, was flagging an extremely oversold in Silver/USD situation on the 6th of October, of a degree that almost always leads to significant bounces or consolidations. Not a super-bold call perhaps, given the degree of violence in the drop, but the market soon found a support zone, and proceeded to rebound significantly. The preceding drop back down post the election of Donald Trump as POTUS, however, was not predicted by us to any meaningful degree, we only had a critical level which was busted and warned that positive scenarios looked murky, but nothing in terms of a stated opinion. So, miss on that market move, on our part. Then on the 21st of November 2016, our adaptive channel system once again warned that oversold conditions were approaching. As it turned out, the market did consolidate and correct upwards, but not in a particularly easily traded way. Then in late December 2016, pattern clarity in Silver/USD improved considerably, allowing us to make some longer-term wave pattern calls with increased confidence on the 30th of December 2016. The first one of them, that Silver/USD would hit $18, was achieved some 2.5 months later, as we know today. We’ll see if the rest of targets – masked in this free summary update – are also hit. The jury’s out on those, as the saying goes. On the 27th of January 2017, as Silver/USD was correcting against what we perceived to be a support cluster, our composite technical analysis made it clear that we believed a trend resumption upwards was the most likely (barring a break of then-critical level $16.20, which didn’t occur). Incidentally, and somewhat unexpectedly, Silver/USD bottomed that very day. On the 2nd of March 2017, while the uptrend in Silver/USD persisted in what we postulate is an A-wave, we were very certain it was close to ending. Usually, it pays to trade in the direction of the trend, but sometimes you have to make calls for it to end. (Finding this balance is one of the hardest things in the world of trading and investing.) Anyway – Silver/USD had hit and somewhat surpassed our $18-target, and while the bigger structure is quite likely to hit $19 later this year, it was time to warn of a top. Incidentally, that call for a correction hit the general top price zone fairly well, and Silver/USD has since corrected quite violently all the way down to the support around – it almost immediately confirmed the correction by blasting through the important $17.90-level. Analysis updates written after the 2nd of March are not included in this summary. All in all, our Silver/USD-analysis from October 2016 to early March 2017 has been fairly good, certainly not perfect during Q4 2016 (pattern clarity was low to us), but very good from late December 2016 to early March 2017. A call which we make in this free analysis summary is for Silver/USD to hit $19 some time during 2017. The jury’s is out on that call, and if Silver/USD falls through the $16.65-area during this corrective phase, then the $19-goal will probably (but not certainly) have failed. 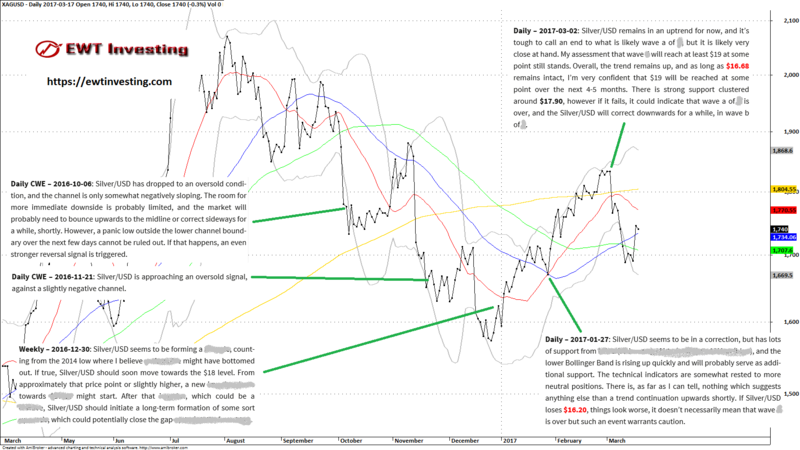 Of course, we continuously re-evaluate our technical analysis readout of the markets, but as things look for Silver/USD at the time of this free analysis summary, $19 remains a target for later this year. We shall see.